I remember quite well when I was a little girl and would come down with a fever or feel sick, my mom would tuck me in her and my dad’s big king-sized bed, find a movie for me to watch, and heat up a bowl of chicken soup to slurp throughout the day. One specific memory stands out when I watched The Secret Garden three times in a row and imagined that I too had an overgrown garden in my backyard to explore. Many of you reading may be very familiar with the smell of this simple meal and how it reminds us of times when we were comforted and cared for. When I was away at college and Andrew and I were just starting out, I started making my own broths (among other things) to help save what little money we had. Being a cheap but hearty meal, we ate a lot of roast chickens with vegetables in our little home by the river. Tucked back in our very small hallways of a kitchen, I’d sip red wine and listen to Edith Piaf as after supper as I hand-washed our dishes. We had a really deep farmhouse sink that allowed us to fill that baby up when we were lazy, so I tired to stay on top of the dish washing so it wouldn’t get too overwhelming. 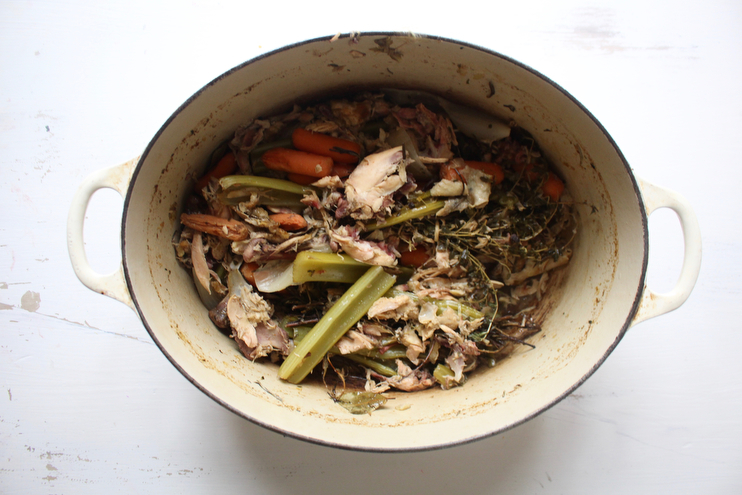 After dishes on evenings when we had roast chicken, I would take the carcass of the bird along with other kitchen scraps that were about to turn and fill my big cream dutch oven with water. I use the same one to this day, a beloved Christmas present from my parents that year. I’d throw in dried herbs if I had any on hand, but most times I did’t so that was that. Most broths I made were made up of leftover bones, a few measly carrots, some celery with the curly tops, and a onion chopped in quarters. And water. Lots of water. I would put it on the back burner of our tiny two burner oven and let it simmer away for hours and hours throughout the night. Andrew and I would wake to the predominant smell of chicken, and before I had to go to class I would strain it in mason jars to have later with noodles or as a base for any kind of soup. I never usually got around to freezing it but that’s an option too. Making my own stocks and broths was a simple and delicious way to make the most of what we had when we had very little. Now many years later, we can afford to buy these things at the store but nothing compares to the taste of homemade, so I’ve continue the prudent path of making my own when our meals lend themselves to the situation. Any time we have a big meal my family, extended or otherwise, knows to “never toss the bones because Amanda will use them!” They are right and I certainly do. Below is a no frills way to make homemade bone broth, but before I go into those steps let me share something really interesting with you! Whether they knew it or not, your grandmother and mother were giving you medicine in the form of chicken soup if you weren’t feeling well. It’s an interesting perspective to take, but all food can be considered medicine if it is good for us. Because of the slow process in which bone broth is made, this liquid has a wealth of medicinal properties to help heal and restore one’s body. It is rich in minerals with healing compounds and collagen that can line your gut and reduce inflammation. If you have tummy problems, you may want to drink this to help. Along with immune support, bone broth is known to restore energy and promote a good night’s rest. It is chock-full of good things for you, so in addition to giving you comfort and liquid to prevent dehydration, it actually helps heal you in an abundance of ways if under the weather. Pretty neat, huh? *You can use beef bones too. Completely optional. To prepare, put the bones on a roasting pan in the oven at 350 degrees for about 20 minutes so they brown. This step will give your broth a richer more full flavor, but you can skip it if in a rush. Next, place all ingredients in a stockpot or slow cooker (at least 10 quarts in size) and cover with cold water. If you are using stockpot, bring the water to a boil over high heat but if using a slow cooker, turn the temperature to high. Once simmering, reduce heat to low and cook for 30 minutes. You’ll want to be around for this step. It’s the most time communing one because you’ll have to skim and toss the yucky stuff that rises to the top. I use a fine-mesh sieve ladle to get rid of the impurities that float to the top. Finally, simmer uncovered for 12 to 15 hours, adding more water as necessary just to keep the bones covered. 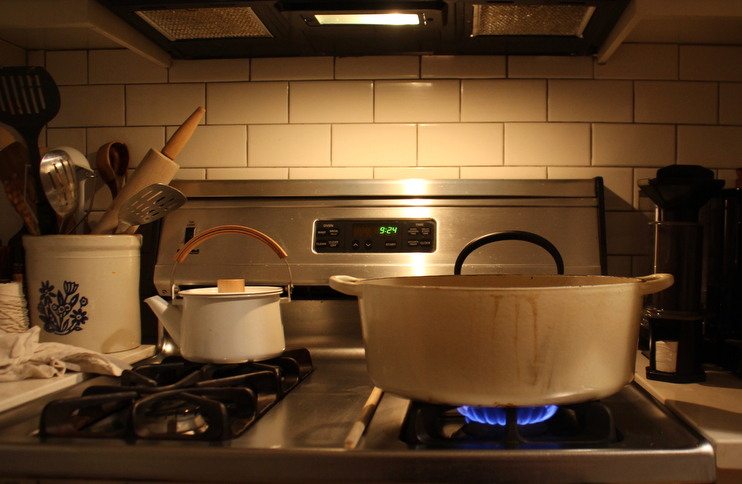 Make sure if you do this before you go to bed that you have enough water in your stockpot so your ingredients don’t burn up over night. When you wake up, strain the liquid through a fine-mesh strainer into a big glass jar. You can fill one large or several small ones, depending on how you want to use your broth. 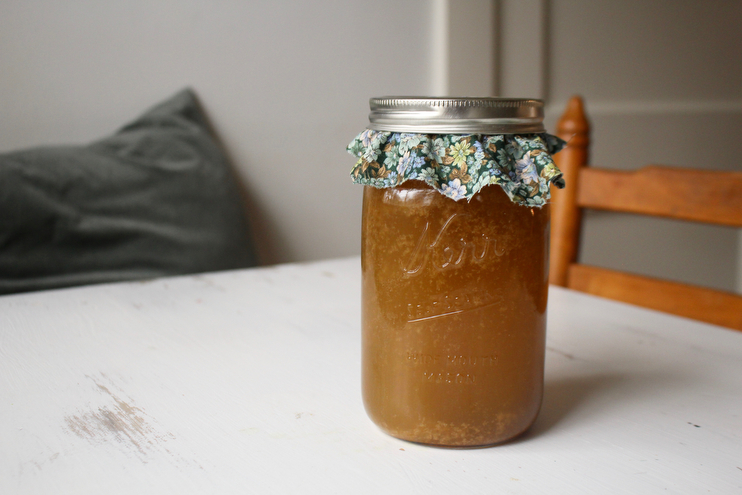 Your bone broth is now ready to be used right away, or you can cover and refrigerate it for up to 1 week. If you want for meals down the road, I would opt to freeze for up to 1 year. Make sure to remove any fat that has solidified on the top before using, this will be a light yellow color and will sit on top of the gelatin. I save this fat and use it when sautéing vegetables for other dishes so it doesn’t go to waste. How can you use bone broth? For starters, you can have it plain with warm, crusty, buttered bread. It’s delicious, but you may want to season it with a little salt beforehand. I also use it in soups, for risotto, in sauces, and with egg noodles. It’s a wonderful recipe to have on hand year-round, but especially in the wintertime when you’re more prone to catching a bug. Consider it a natural and whole remedy you can keep in your back pocket for rainy day cooking or simply if you need it to feel better. I love making bone broth, but I usually do it all day long so I can enjoy how it makes my home smell. Such wonderful tips for making use of everything! If only more people were so conscious of their waste. I personally love bone broth and it is in my rotation diet.